Not long ago, the subject line of this post would have been an uncontroversial humanitarian statement. Today, it’s heresy against progressive doctrine. We’re supposed to inquire about the race of victims of police violence before we can say if their lives matter. It’s true that a heavily disproportionate number of those victims are black, so it’s entirely appropriate to say with special emphasis that black lives matter. This must, however, stand behind the broader principle. In any society in which only some lives matter, it’s the people who are more marginalized whose lives don’t. Yet saying that all lives matter gets you smeared. Today I saw a cartoon in which a person who said that “All lives matter” then revealed a “No Muslims allowed” sign. Is it necessary to point out the number of innocent Arab Muslims who’s died at the hands of the United States? How is saying that their lives matter anti-Muslim? Yay! My latest article is up on the FEE website. This is one I’m especially proud of. I originally titled it “America’s Concentration Camps”; the editor added the words “are a warning, not a model.” My research for it included not just websites but books (antiquated concept!). My inspiration, if you can call it that, was Trump’s obliquely suggesting that Roosevelt’s internment of Japanese-Americans was a good thing, and some of his supporters making it more explicit. It doesn’t hurt that the article gave me an opportunity to quote George Takei. After a reboot it did the same thing again. I searched for Android File Transfer Agent and found there was nothing by that name on my computer. Nashua police and school officials are claiming to have broad support from parents, yet a lot of people didn’t trust them when they said the schools were safe to reopen Tuesday, after the threat which resulted in all the schools being closed on Monday. An AP report says that attendance on Tuesday was down significantly, more than normal ducking out on Christmas week would account for. Somewhere between 30 and 35 percent of the students at the two Nashua high schools didn’t show up. Can anyone blame them? The police claimed the threat was plausible enough to justify closing not just the two high schools, but all the city’s public schools, and yet they refuse to tell us anything specific about the threat other than that it was directed at the high schools and named December 21 as the date. There are extra police in the schools this week, even though the threat is allegedly gone. Everyone except government officials knows that murderous attackers can easily change details of their plans or lie about them in the first place. If the schools were in grave danger on Monday, there’s no reason to believe they’re much safer now, given the claimed seriousness of the threat and the lack of information to go on. As I said before, it makes sense to withhold details that could be “fingerprints” of the threat, but we should at least know what kind of threatened attack prompted such a drastic response. It reminds me of the locking down of six cities in the Boston area while pursuing the Tsarnaev brothers. The public is simply considered an inconvenience to be kept in the dark even when it’s in danger. People are still claiming that ordering everyone to stay inside their homes was what allowed a person who went outside his home after the order was lifted to find Dzokhar Tsarnaev. I’m less scared of this mysterious threat than of what the police might do while hunting it down. Yesterday all the public schools in Nashua were closed because of a reported threat against the city’s two high schools. The schools are reopening today. This bothers me. The school officials decided the threat was serious enough that it didn’t stop at the boundaries of the high schools, so why should we think it stopped at the boundaries of the public school system? Did it extend to private schools? (Bishop Guertin High School, the city’s biggest private high school, is apparently closed for the week, so at least they didn’t have to decide based on inadequate information, but the city has at least one other place that calls itself a high school and several colleges.) Did it extend to Nashua’s shopping centers, which are crowded this week? To where I live? Reports of looking for a “device” and news pictures of a bomb squad vehicle suggest that the threat involved a bomb, or perhaps that a bomb was one of several possibilities. I understand not disclosing everything; identifying a suspect by knowledge of unpublicized details is a standard investigative technique. But the assurance that an unspecified threat is no longer credible, based only on a search of the schools, isn’t very convincing. The bottom line for me is: How should I react? Most obviously, I should avoid the high schools for a while. The next couple of days will be abnormally warm, great for bike riding, and one of my favorite routes goes through Nashua South’s parking lot to Mine Falls Park, but I’m going to avoid it. It’s not bombs I’m afraid of, but cops who might arrest anybody for no reason. I’m avoiding the shopping centers anyway; they’re too crowded. 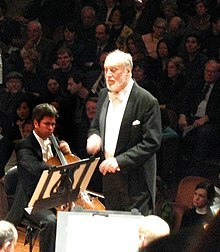 Today I learned that conductor Kurt Masur has died. It always saddens me to learn about the loss of a major musician, but I’ll admit I’m not a connoisseur of conductors. Unless a performance is really out of the ordinary or noticeably sloppy, I don’t notice the difference, except for a few bits of interpretation which I’m fussy about. On that point, Masur doesn’t pass my Beethoven’s Ninth test (the passage at measure 513, as Toscanini knew, is a juggernaut, not a funeral march!). But no matter; in reading about him, I learned something much more important. Yesterday I read a LiveJournal post that told me a lot about the desire for “safe spaces.” The author thought that authority should put an end to all the guns in the world, presumably making its own into plowshares after using them to disarm the rest of the world. In the absence of that, he wished that at least it would establish a regime of censorship, so we’d be “safe” from hearing views we don’t like. I’ve seen it lots of times before, but seldom so naively expressed. The lack of realism helped me to see through to the underlying wish for someone to take charge and make him safe from everything. We all want to be safe, of course. What’s disturbing is the way people keep turning to demagogues who promise safety if they’re only given enough power. History has shown how badly that works, over and over, but the wish for a great protective leader keeps coming back. I’ve got a new article on the FEE website on laws which make it a felony to record speech made in public without permission. A couple of examples are from New Hampshire, which has one of the worst laws. If enough people read the article, I get a bonus and they’ll like me better for future articles, so please repost the link if you’re so inclined. Trumpism seriously scares me. Not so much Trump himself as Trumpists. When I walked around my neighborhood yesterday, I saw three houses with Trump signs and wondered what kind of people live there. One of them had another sign saying a “badass guard dog” is in the house; maybe that gives a clue.